Ok, it’s definitely time to give in and admit that Christmas is coming. It’s next month! And what more enjoyable way to do a spot of Christmas shopping than at a Christmas market. Imagine this… lots of independent retailers all within spitting distance of each other, ample supply of Glühwein and similarly spiced and heated winter beverages, plus no odd looks from the shop assistants if you try to buy something while balancing a glass of plonk in your other hand. What’s more, these stalls don’t close at 6pm. So you can make an evening of it, freeing up your day for something that requires daylight to enjoy it. The concept of Christmas markets has gradually made its way from the continent in recent decades. And today you’ll struggle to find a major UK city that doesn’t offer one for at least a few days in the lead up to yuletide. Some of the more established ones open in mid November and don’t close until St Nick is due to squeeze down the chimney. 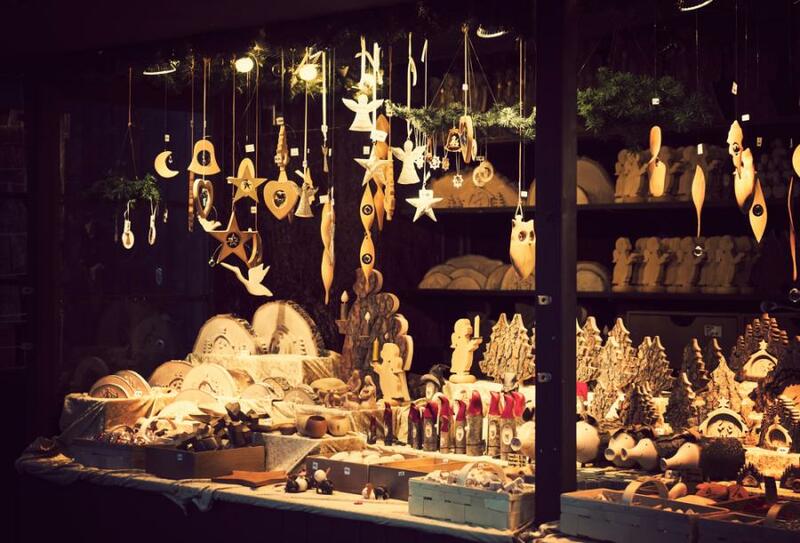 What’s so cute about Christmas market shopping is the vast array of handmade homewares and tasty treats. The markets are perfect for finding knick-knack gifts, stocking fillers and presents for those particularly tricky friends and family who either have everything or just like the quirky things in life. And so the Christmas market holiday has become quite a ‘thing’ too. Hence it would be remiss of us not to point you in the direction of the biggies and point out a few of the smaller markets too. We’ve tried to cover most of the UK, so happy shopping and don’t forget to put us on your list too! As if someone has sprinkled fairy dust over the city, Glasgow’s St Enoch Square sparkles with the spirit of Christmas until the weekend before Santa arrives. There’s an international theme to the gifts and a continental flavour to the edible goods. Add in a splash of Scottish hospitality and you won’t want to leave. If you’re staying in a Loch Lomond cottage, head in on the train from Balloch so you can enjoy a mulled wine or two while you’re there. Short and sweet but packed with impressive light displays and more than an ounce of Yorkshire essence, you’ll be left wanting more. Harrogate sets itself apart from the Christmas market crowd not just for its brevity but also for its ethos of handmade, homemade and fairly traded regional products. From decorating your tree to lining the base of it with presents, you’ll find most of those goodies right here on the stalls. Music is provided courtesy of local buskers and Santa even rocks up with one of his reindeer. After a trip to Harrogate this weekend, you’ll be ready for your turkey before December’s even started. This one’s won awards it’s so good! Manchester is a fabulous spot for shopping at any time of year. The addition of its vast Christmas market just adds to the atmosphere. If you want to make the most of your trip into Manchester from your holiday cottage on the outskirts of town, get an early train into Manchester Piccadilly and plan to spend a full day in town. There are more than 300 stalls dotted across the centre of town, so add those to all the existing shops and you’ll need your flats too. But boy, will you be deserving of some mulled wine and a bowl of Hungarian goulash by the end of it. If you don’t get all your Christmas shopping done here, you must have some seriously tricky people to buy for! The shopping in Belfast is superb at the best of times. Add in the variety of local and European traders selling their unique gift ideas and your Christmas shopping will be done before you can complete a chorus of Jingle Bells. The market, in the grounds of Belfast City Hall, promises a welcome of only Northern Irish proportions, including Lavery’s traditional Irish Bar for entertainment and refreshment. The grand opening of this festive market is sparked (forgive the pun) by the Leamington Spa Christmas lights switch on. Yes, it’s a bit early, but all in the spirit of festive fun. The market has the usual European influence with food and craft stalls flowing in abundance down The Parade. And before you book your online shopping Christmas delivery slot, the final day sees the addition of a local farmers market. So if you’re spending Christmas in a holiday cottage near here this year, you can buy local and take home all those wonderful memories. It’s the 21st birthday of the Cardiff Christmas Market this year and to celebrate has added space for more stalls in Hills Street. Stall holders are predominantly Welsh, so this is an amazing opportunity to discover local Welsh producers and to buy something uniquely Welsh. In amongst the typical food and drink offerings you’ll find Welsh cheeses and freshly hot Welsh cakes. See Cheltenham’s leafy Promenade transformed for its 12th annual festive shopping event. You’ll more than get your fill of European foodie experiences here and this year they’re extending the bar and Bratwurst grill! Amidst the 40 chalets you’ll find some tempting you with traditional Gluhwein, French crepes and olives from across the Med. Small but perfectly formed, Devon’s biggest Christmas market is nestled in the dramatic shadow of Exeter Cathedral. In fact this year it’s bigger than ever. Of the 50 or so chalet stalls a fifth of them are taken by local producers selling their locally sourced and locally made wares. So forget the bog standard holiday souvenir. Before you leave your rural retreat this autumn pick up a genuine local keepsake to remind you of this beautiful county (and to entice you back next year). The festivities in Winchester bear a sense of spectacle thanks to the market’s position within the atmospheric Cathedral Close and the addition of an ice rink. It’ll come as no surprise then that Winchester claims to be England’s Christmas capital. The ice rink is bordered by some 100 gift and refreshment chalets. So chances are you’ll head home with a bruised bottom and more than a couple of handmade British gifts. Note: this one is brief. The Victorian takeover of Portsmouth’s historic docklands doesn’t last long and that makes it even more worth a visit (and a mention in this list). Even jolly old St Nick has regressed to his green velvet suit of Victorian times for the occasion. In case snow hasn’t settled before the end of November, you’ll find plenty of it here (albeit fake) while you shop for wares traditional and new. Historic Rochester in Kent provides the perfect winter short break opportunity hosting its festive shopping event over three weekends from the end of November. If you opt for the middle weekend, you’ll be in for an extra treat as the Castle Gardens transform into a Dickensian era village. One things for sure, there’ll be plenty of roasted chestnuts and there’s even the promise of snow… Bavarian village meets modern day farmers market – in other words, you won’t be spoilt for choice and you’ll be partaking in an event thoroughly embraced by the local community. So we’ve guided you north to south with a meander east and west. Now all you have to do is decide where you want to spend your weekend, book your cottage and follow your nose to vats of steaming cinnamon infused mulled wine.